Out on Farm Road 546, five miles, southeast of McKinney, stands a unique and interesting little church. Its membership is not great, to judge by big community churches, about 50 enrolled, but it has long survived as one of the substantial churches of the county. 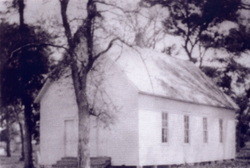 The East Fork Baptist Church was organized in 1877, but it was not till 1889 that it went into its own building at the old Lowery Crossing on the East Fork of the Trinity. When first built the church was above the high-water stage of the creek, and remained for over 25 years. But the lowlands silted up and built up the floor of the valley to such an extent that water entered the building up to the window sills during overflows, just before the First World War. In 1917 Mr. J. R. Dunn gave an acre of ground for a new site, and the old building was torn down and built in its present location about 1918. It is modern in construction; electric lights, water, and has a floor sloping away like an opera house. Its seating capacity of around 600 is large for the 40 by 60-foot building. The solid-white church, standing on the hill overlooking East Fork valley is very picturesque. Farm Road 546, which runs in front of the building, is the old Millwood Road. Before the Civil War this was the only road leading southeast out of McKinney. It went out present Greenville Street and turned south to cross the little creek just west of the Dungan Dairy. It is still there, by the way, but Greenville now continues on to cross the old Iron bridge just below Highway 24, on the old Farmersville road. After crossing the creek just west of Dungan's Dairy the old Millwood Road turned east and followed the present road around the edge of East Fork valley. Down where the Eastline Railroad was later built, the road branched, one prong turning east to cross East Fork and then up the worst hill in Collin County to the old Enloe settlement, and on to East Texas. This was the road over which practically all the lumber from East Texas was hauled to build the early homes in McKinney. During rainy weather, however, in coming from the east wagons would turn north, east of present Princeton, go northwest and get on the stage road north of present Woodlawn and come into McKinney from that direction. But back to the Millwood Road. From near the later Eastline rail road the Millwood Road followed the present road on around the edge of the valley, coming out on present Farm Road 546 about where the W. G. Drake store stood a few years ago. From there it followed the present 546 and crossed the creek at the old Lowery Crossing. Millwood, which lies south of the Lavon Dam, was an important trading center in early days, and was, for many years, the only town in south and southeast Collin County. Its importance was due to its being, for many years, the chief distributing point for lumber brought by freighters from East Texas. The Reverend W. R. Murley is pastor of the East Fork Church. Mr. Murley works six days a week in the Consolidated factory at Fort Worth and preaches at the church every Sunday. Despite the fact that Reverend Murley is paid to preach there only twice a month, he does so every Sunday. Most of the time he comes over early on the Sabbath to visit the sick and infirm, whether they are members of his congregation or not. A good many of the people living in the vicinity of the church work and hold positions in McKinney, though most farm. Among those living on the road within a mile or so of the church are T. B. Enloe, Charlie Renfro, C. A. Drake, E. C. Dent, J. M. Drake, Odis Tallent, Roy Wilson, Jack Linderman, Jack and Bob Evans, W. K. Gant, H. D. Manchew, Grady Jenkins, C. A. Milam, Charles McCormick, and V. W. Wilson. Mr. Jenkins and family live in the old George B. Kindle home and Mr. Wilson, who has been there since 1914, on the old Tom (Stut) Davis place. Mr. Milam is related to the famous Ben Milam of Texas history fame, and has a son eleven who is named for the old hero. He is employed in a responsible position at the Veterans Hospital north of McKinney. Twenty-five and thirty years ago they really had a Sunday school at East Fork. Bob Honea, Milt Cleveland, V. W. Wilson, George Kindle and others had big families-eight to twelve each-and when they went to Sunday school they added a lot to its enrollment of 125. Mr. Wilson, who is an old friend of this writer's, had eleven children, and has them all living now within driving distance. He also has 25 grandchildren and nine great grandchildren. The county singing convention meets at the East Fork Church on the second Sunday in June, and preparations are already under way for it. Not too many years ago singings were held there rather frequently and people came from McKinney and all over the county to attend them. This is one of the very few neighborhoods in Collin County where the activities of the community is centered around a church. Most take their name from a school house or a store, or from an early settler. Any country church surviving for seventy-five years must be good, and to be good it must have a membership of sincere people. The East Fork Baptist Church appears to have them both.